Becoming a widow is one of the most traumatic life events that a woman can experience. Yet, as this remarkable new collection reveals, each woman responds to that trauma differently. Here, forty-three widows tell their stories, in their own words. Some were widowed young, while others were married for decades. Some cared for their late partners through long terminal illnesses, while others lost their partners suddenly. Some had male partners, while others had female partners. Yet each of these women faced the same basic dilemma: how to go on living when a part of you is gone. 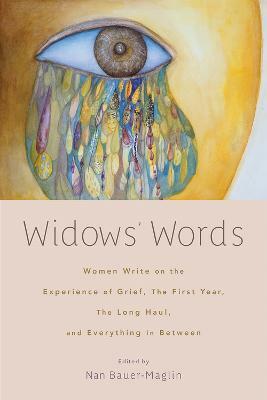 Widows' Words is arranged chronologically, starting with stories of women preparing for their partners' deaths, followed by the experiences of recent widows still reeling from their fresh loss, and culminating in the accounts of women who lost their partners many years ago but still experience waves of grief. Their accounts deal honestly with feelings of pain, sorrow, and despair, and yet there are also powerful expressions of strength, hope, and even joy. Whether you are a widow yourself or have simply experienced loss, you will be sure to find something moving and profound in these diverse tales of mourning, remembrance, and resilience. Nan Bauer-Maglin worked at City University of New York for almost forty years as a professor and administrator. She now volunteers for Girls Write Now and The Whitney Museum. She is the editor or coeditor of many books, including Cut Loose: (Mostly) Older Women Talk about the End of (Mostly) Long-term Relationships.